For some time, I’ve wanted Fantasy Flight to do more Arkham Horror but not just expanding the already huge game. So, the announcement of Mansions of Madness was great news. If you’ve played ‘Betrayal at House on the Hill’ then think of ‘Mansions of Madness’ as ‘Betrayal at Arkham Horror on the Hill’ – which isn’t a bad thing at all. 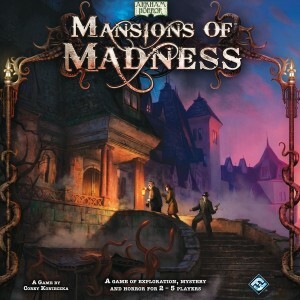 Mansions of Madness pits one player (the Keeper) against up to 4 other players who are investigating strange goings on at the mansion (crypt, chapel, etc.) The board is made up of room pieces whose layout is determined by the story (defined in the rules) that is being played. The players don’t know the reason behind the weird happenings and it’s their job to uncover enough clues so that they understand how to defeat the evil that is at work. The Keeper plays the role of the evil side – causing weird happenings, controlling the monsters, etc. – and their goal is to defeat the investigators. Each investigator has a character with various statistics and equipment which they use to explore the house, defeat puzzles and battle monsters. Investigators also have a health score (if it reaches zero they die) and a sanity score (if it reaches zero they go mad but aren’t out of the game – instead, they’re more likely to do bad things). A player’s turn consists moving up to 2 spaces and taking an action. The most common action is to explore a room which means they get to see the face down cards in that room which could be equipment and/or clues but they can also be locks which require the player to solve a puzzle or find the right item to access them. Each turn, the Keeper gains threat tokens (based on the number of players) which they can spend on their abilities (determined by the story being played) which they can use to summon monsters, set fire to things, cause bad events, etc. The Keeper also gains mythos cards which cause nasty things to happen to investigators during their turn – such as finding their weapon has run out of ammo, being plunged into darkness, or being freaked out by a spooky noise. Most mythos cards cost threat tokens to play too. The Keeper can also gain trauma cards – both physical and mental – which they can play when an investigator loses health or sanity respectively. These cause on-going problems or penalties for the investigator like a broken leg, loss of balance or a mild insanity (such as being compelled to steal items from other players). Some of these can only be played if the targeted investigator has low enough health or sanity levels – in fact, some cards can only be played on insane (zero sanity) investigators. Only when the objective card is revealed do the players know what they (and the Keeper) need to do to win. The objective is revealed when all the clues have been found, or enough time has passed, or when the Keeper causes it to be revealed it. The Keeper, however, knows what the objectives are from the start. Over time, event cards (determined by the story) get revealed which can suddenly increase the amount of monsters, etc. Overall, I really enjoyed my first plays of Mansions of Madness. Physically, it looks great and the monster models really add to it. 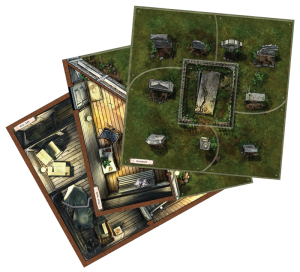 The room tiles could be combined to create a massive variety of layouts (it would have been great when I used to play Call of Cthulhu RPG) although only 5 board layouts come with the game (more on this below). The puzzles that must be solved to open some locks are a really nice touch rather than just using a dice roll as they are both tactile and logical. There are 3 different physical puzzles, each requiring the player to move the pieces around until they match the solution but they have a limited number of moves each turn. The game mechanics are what you would expect from Fantasy Flight with various tests of characters’ stats modified by equipment; however, there are some nice touches. For example, the players are not allowed to view the stats of a creature until they have been damaged so they can’t plan too precisely beforehand – even the Keeper doesn’t know the exact stats of each creature as the same models have different abilities or stats written on their underside. Also, players don’t know what the Keeper may throw at them next. Combat is simple and quick as a single card (depending upon the creature attacking, or the weapon an investigator uses) describes the dice roll the investigator needs to make and the results if they succeed or fail. During the game, the Keeper’s choices are primarily based on the abilities they are given by the story but there’ s still lots of decision-making left allowing the Keeper to feel they’re involved and playing the game, rather than just being a facilitator and the game is playing them. Choosing how to allocate threat tokens, move monsters, and use cards mean the Keeper is truly playing against the investigators. That said, some stories seem to be more interesting for the Keeper than others. There’s lots of great flavour text to add atmosphere on all the cards which I enjoy. 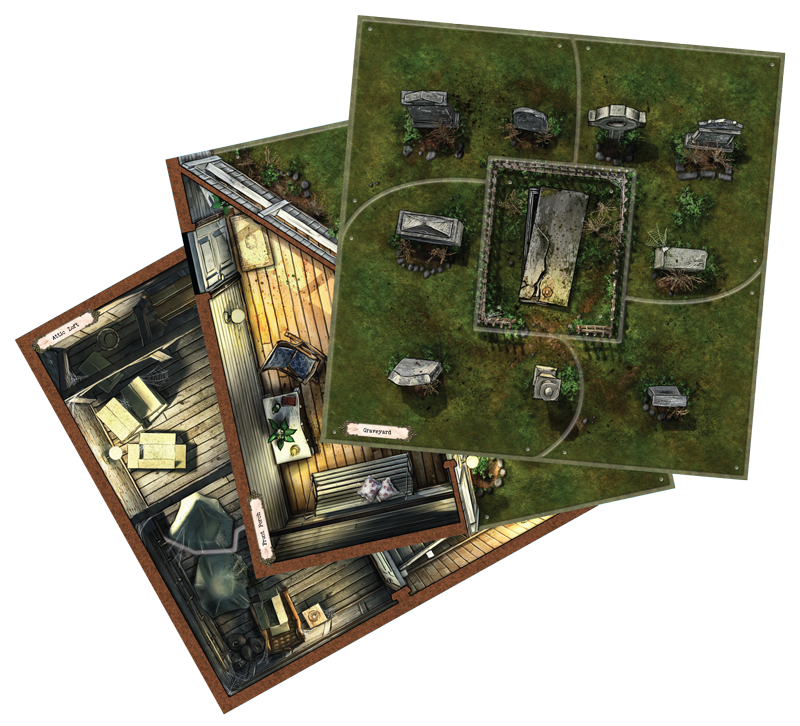 The game comes with just 5 different stories (layouts) provided in the rules. In each one, the Keeper must make 4 or 5 choices during each the set-up which can make small to large variations (like where a ladder is placed right up to the entire reason behind the story). For example, the reason behind one story (the disappearances at the hospital) could be because a creature is loose, or a cult is gathering corpses, or there’s a gate to Ry’leh (although I made these up rather than give any game details away.) So, there are 3 main storylines for each of the 5 stories and the rest of the Keeper’s options mix-up where key items will be found and other minor variations. Plus, non-essential items get spread out randomly. I like that thought has been put into varying each story especially with the choices the Keeper makes, but is it enough? Well, it depends upon what you want from Mansions of Madness. The clever part is that, even though you may have played a story before, you can’t easily tell what the Keeper’s objective is because they have the same abilities no matter what. If played frequently enough, players could start to learn what the likely objective is but they still need to find the clues and defeat the evil, i.e. they still need to play and win. If your primary need from the game is to discover a new story every play then this may not be enough for you; however, most boardgames have the same defined win conditions for each play and that’s not a problem because it’s achieving the win that is the goal. For example, playing new Space Hulk missions was always cool as it was a journey into the unknown but it didn’t make those missions any less replayable. I do think there could have been more than just 5 stories with Mansions of Madness (as it feels a bit tight) but I think replayability will be good (especially for me who won’t get the time to play it dozens of times in short succession) plus there’re bound to be expansions. The only real criticism I have of the game so far is that the cards laid on the board do make it fairly obvious where the all-important clues are as these are usually under a lock card plus maybe one or two other cards. I don’t think I’ve seen any random cards discovered by exploring that are anything but equipment. So, I’d like a few random (but minor) events to add to the mix, or even just some more padding cards so it’s less obvious where the important cards are. However, this is a minor point and Mansions of Madness is a fun to play, atmospheric, story-based, Lovecraft-themed game (more for serious gamers than light gamers) which is exactly what it should be. As it’s from Fantasy Flight, I’m sure plenty of expansions will be released but I hope Fantasy Flight can price these reasonably. 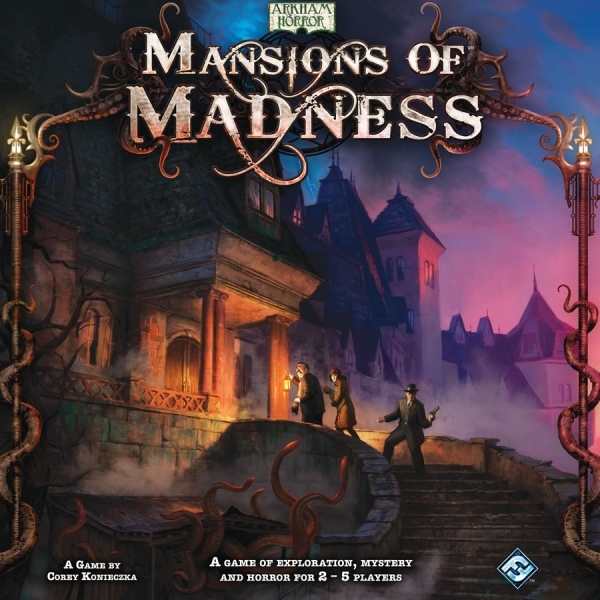 This entry was posted on Tuesday, March 22nd, 2011 at 11:07 pm	and is filed under Arkham Horror, Board Game Review, Board Games, Mansions of Madness. You can follow any responses to this entry through the RSS 2.0 feed. You can leave a response, or trackback from your own site. Do you find that the game plays quickly enough that you can play several rounds, so that each player gets a chance to be the Keeper? I ask because one of our favorite one-against-many format games is Clue Museum Caper, in which every player has one chance to be the thief, and the player who escapes with the most paintings wins the game. Thanks, Paul. I haven’t played Clue Museum Caper but Mansions of Madness can take quite a while to play (unsurprisingly being a FFG game) so it’s unlikely you’ll get more than 1 or 2 games in an evening, but it depends upon how experienced the players are at it and how long your games session is. Still, I doubt you’ll get 4 games during a regular session – not that that’s a bad thing, but I don’t think it will play in the way you asked about. Good review. I’ve played this a lot with my friends who picked it up release day, and while we still like it, we’ve also found some problems with it. Like a couple of scenarios being incredibly imbalanced. In addition, if the Keeper has any amount of experience and is playing to win, it’s nigh impossible for the investigators to win. In addition, the fact that investigators can basically try to kill themselves to come back as a fresh investigator is incredibly annoying and not very flavorful. I agree. I’d like some events – some good for the investigators, some bad – a bit like a the location cards for Arkham Horror. That way the rooms become more explorable and less obviously ‘non-plot’ rooms. Thanks, Tim. I hope more scenarios will be released very soon so that the scenarios that can be less-balanced will be less common. The ‘no-one wins’ endings have happened a couple of times for us which can be a bit disappointing. Investigators offing themselves has come up twice in my games. One time was a bit annoying because they ran into a fire knowing the objective would be revealed the next turn and wanted a strong investigator (who I, as the Keeper, had been whittling down ready for my objective). It does seem a bit too easy to take advantage of the rules this way to re-gain investigators, although it does mean the Keeper needs to be more subtle in their actions. I don’t mind new investigators turning up but maybe (excluding entering combat) players shouldn’t be able to willingly cause damage to themselves which will kill them (unless they’re at zero sanity).